Home / ABS-CBN / GMA Network / Television / TV Ratings / Video / Who leads AGB Nielsen and Kantar Media TV Ratings for Oct. 2 - Oct. 8, 2017? Who leads AGB Nielsen and Kantar Media TV Ratings for Oct. 2 - Oct. 8, 2017? ABS-CBN kept rating leadership based on the latest numbers from AGB Nielsen and Kantar Media. In the overnight ratings from October 2 - 8, 2017, FPJ's Ang Probinsyano remained the leader of both TV survey ratings board. Ang ABS-CBN's Probinsyano posted 40.0% on Kantar Media to retain its leadership status. 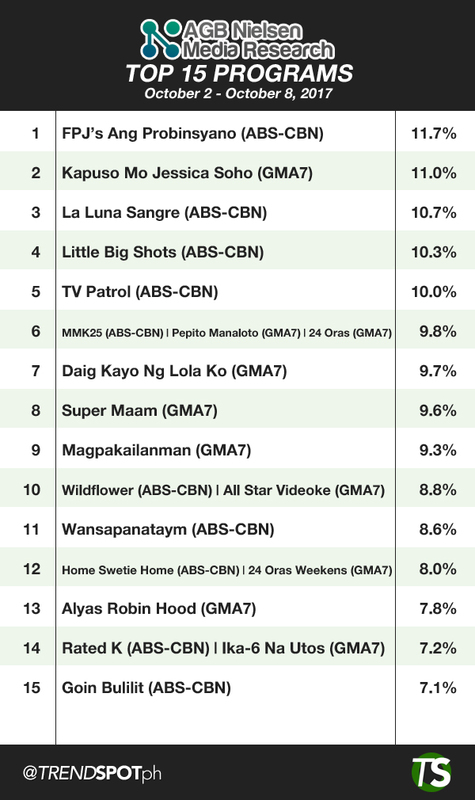 Meanwhile on AGB, Ang Probinsyano secured solo lead with 11.7% on AGB Nielsen to reatain its leadership which was shared last week with another Kapamilya, MMK. Super Ma'am of GMA Network and Ang Probinsyano by ABS-CBN. If AGB's top 3 was dominated by Kapamilya shows last week, Kapuso Mo Jessica Soho avenged this week as it climb to the number 2 spot. KMJS scored 11.0%, just 0.7% behind AGB leader Ang Probinsyano. KMJS lead Kapuso shows in the top 15 progams of this weeks ratings board. 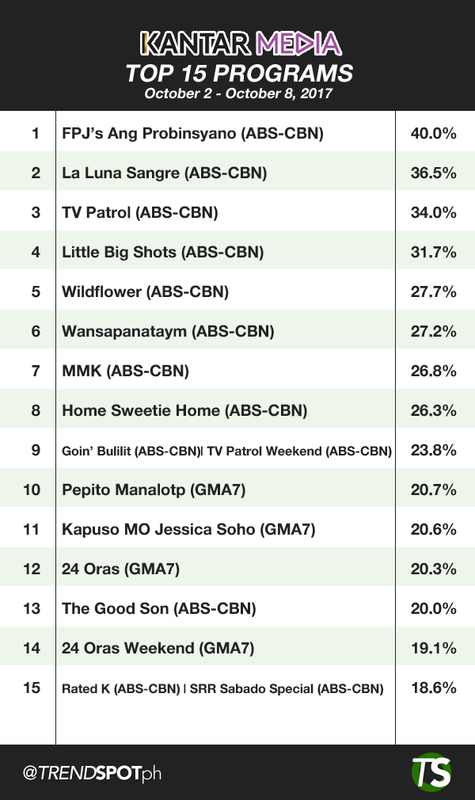 Completing the top 4 in AGB Nielsen's leader's baord this week are La Luna Sangre, 3rd with 10.7%, Little Big Shots, 4th 10.3% and TV Patrol in 5th with 10.0%. 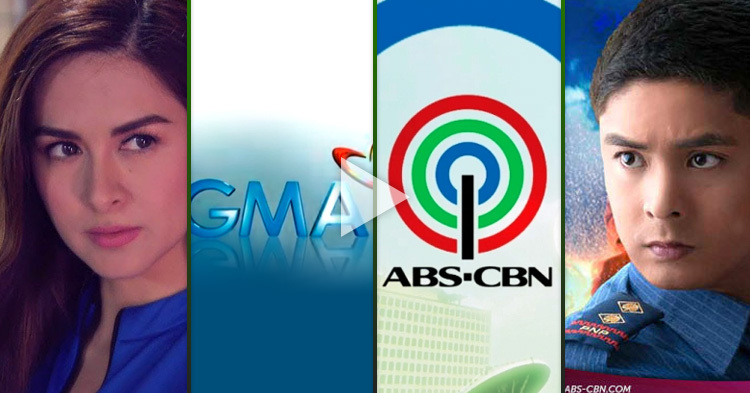 While AGB's ranking was mixed Kapuso and Kapamilya, Kantar again reported ABS-CBN dominance. Last weej's ranking was almost the same with just little changes. TV Patrol and Little Big Shots exchanged placements with TV Patrol now taking the 3rd spot with 34.0% and former number 3 down to number 4 with 31.7% ratings. La Luna Sangre, on the other hand, retains its 2nd spot placement with 36.5% ratings. Here are the rankings of the top 15 shows for the week of Oct 2-Oct 8, 2017.